Check out the new Alliance portal of SolarEdge! Check out the new Alliance portal! 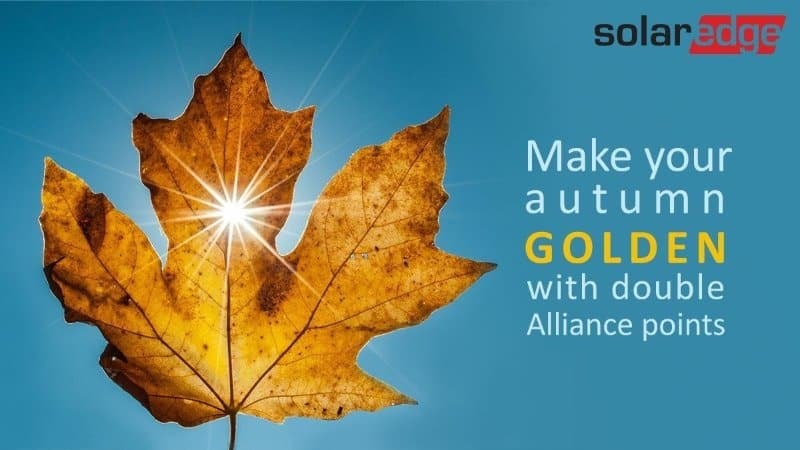 To celebrate the relaunch of the Alliance program, each site registered on the SolarEdge monitoring platform in Europe between September 3rd and December 31st 2018 will be entitled to double points. This allows European installers to get attractive rewards in half the time! Don’t miss out on this golden opportunity! Find out more about our Alliance program now. SolarEdge Technologies Inc. is a provider of power optimizer, solar inverter and monitoring solutions for photovoltaic arrays. These products aim to increase energy output through module-level Maximum Power Point Tracking (MPPT). The company has offices in the United States, Germany, Italy, Japan, and Israel. SolarEdge shares are traded on the NASDAQ. Founded in 2006, the company provides an intelligent inverter solution that has changed the way power is harvested and managed in solar photovoltaic systems. The SolarEdge DC optimized inverter system maximizes power generation at the individual PV module-level while lowering the cost of energy produced by the solar PV system. Since beginning commercial shipments in 2010, SolarEdge has shipped more than 1.3 Gigawatt (‘‘GW’’) of its DC optimized inverter systems, including over 220,000 inverters, its products have been installed in PV systems in more than 73 countries, and more than 100,000 systems are monitored in its cloud-based monitoring portal.